Even without the presence of disease, a person's body will undergo changes in it's structure and function . Skeletal and cardiac muscle adaptations occur because of changes in intensity, duration, and frequency of physical activity (increase or decrease). The adaptations include alterations in morphological, biochemical, and molecular properties. These adaptations in turn lead to altered functional characteristics from the cellular to the whole tissue and functional performance levels. It has been reported that rates of physical activity decline with age and the risk of chronic disease increases which compound the changes to muscle and bone. The good news is that there is evidence that physical exercise provides a myriad of benefits. Regular physical exercise can reduce the risk of chronic disease and increase life expectancy as well as produce improvements in muscle function (strength and power). Multi-modal exercise has a reported beneficial effect on falls rates. Much research, including large scale systematic reviews, have studied what effect exercise has on the older adult for improving muscle strength, aerobic capacity (VO2max) and functional outcomes. Guidelines have been proposed to optimise exercise prescription for the older adult . These guidelines recommend endurance training, resistance exercise, flexibility and balance exercises. There is no consensus in literature for the age range which defines the older adult, or elderly. In general, guidelines suggest that those 65 years or older can be considered older adults. The very old and frail elderly experience sarcopenia (skeletal muscle atrophy) as a result of one or a combination of disuse, disease, injury, malnutrition and the effects of ageing. Muscle weakness that accompanies advanced age has been related to the risk of falling and fracture in these older individuals. Research has shown that older adults with sarcopenia aged 80 years or more are three times more likely to fall in a two year period compared with older adults without sarcopenia. Studies demonstrate that frail elderly men and women retain the capacity to adapt to resistance exercise training with significant and clinically relevant muscle hypertrophy and increases in muscle strength. Strength training, or progressive resistance training (PRT), is generally defined as training in which the resistance against which a muscle generates force is progressively increased over time. The maximal weight or resistance a person can lift or move to complete the movement is defined as the one repetition maximum (1 RM). Prescriptions of repetitions at what RM vary depending on prior experience with PRT and co-morbidities. One recommendation (Level IIA evidence) from the American College of Sports Medicine and the American Heart Association suggests "8–10 exercises be performed on two or more nonconsecutive days per week using the major muscle groups". The guideline also suggests 10-15 repetitions with a weight for resistance at a intensity of 5 or 6 on a ten point scale. Muscle hypertrophy and increased strength, along with the changes in body composition, the hormonal and nervous systems, have a positive impact on the daily activities of living and functional independence of the older adult. One study shows that even into older adults into their ninth decade can experience increases in muscle strength and associated improvements in function following an eight week strength training programme. Strength training can also have substantial benefits for protection from injury in the elderly, as falling is strongly related to hip weakness, poor balance, and postural sway. Of note, research has also shown a reduction in pain following PRT in people with osteoarthritis (6 trials, 503 participants, SMD -0.30, 95% CI -0.48 to -0.13). Aerobic exercise takes place in the presence of oxygen and involves aerobic metabolism of glucose. The exercise is low in intensity and sustained for a longer period than strength training. A decline in maximal aerobic capacity occurs across the adult age-span, accelerating later years. Although both older men and women respond to endurance training with an increase in VO2max, the mechanism of adaptation is different. In older men, two thirds of the increase in VO2max is due to an augmented cardiac output and one third is due to a wider VO2 content difference. On the other hand, in older women, there is a similar increase in VO2max with training; however the changes in left ventricular systolic performance and diastolic-filling dynamics do not occur. Thus, the increase in VO2max in older women is due to peripheral adaptations that lead to the enhanced V02 content difference. Peripheral adaptations include increases in skeletal muscle capillarization and activity of mitochondrial marker enzymes, e.g., citrate synthase. Over time individuals lose flexibility, in a joint-specific manner. Research shows that, in general, the shoulder and trunk become less flexible, while elbow and knee range is preserved to a greater extent.At the same time, older adults adopt certain movement patterns and postures as they age due to habit, injury or disability. Oftentimes, these movement patterns and acquired postures result in muscles and other soft tissue that is continuously held in a shortened or lengthened position. This sustained change in length of the muscle and other soft tissues (e.g. fascia and ligaments) results in a reduced ability to generate power. Stretching is indicated to promote adaptation of shortened muscles to a more lengthened position to achieve better posture and movement patterns, along with muscle power. Muscles held in shortened positions appear to have a biased muscle spindle that may lead to active and passive resistance to increased length, resulting in muscle imbalance during movement and even painful movement patterns. There is comparatively less research on flexibility compared to other components of exercise prescription and there is little consensus on optimal parameters to prescribe in flexibility prescription. Slow static stretching is recommended for stretching the collagen tissue that is the substance of the soft tissue. The ACSM recommends a frequency of at least two days per week, at an intensity of "moderate" i.e. 5–6 intensity on a scale of 0 to 10. The ACSM recommends using sustained stretches for each major muscle group and static rather than ballistic movements. Static muscle stretches of less than 45 seconds can be used in pre-exercise protocols without significant decrement to strength, power or speed type tasks. ACSM recommends stretching for flexibility should be performed after, not before, tasks requiring muscle power or speed. Research suggests that older adults are ambivalent to the importance of flexibility training on their functional ability although frail elderly have been shown to experience improvements in a range of functional measures such as functional reach and sit to stand. In general, PNF stretching appears to be more effective than non-PNF techniques for improving flexibility outcomes ( but not necessarily functional outcome measures). Research reports beneficial effects on falls rates after multi-modal exercise.For more in depth discussion of exercise prescription in the context of falls see the Falls Physiopedia page. Water-based exercise is useful for those who cannot tolerate the stress of land-based exercises. Not only does the water provide the necessary resistance for working out your muscles and joints, it also provides a low-impact environment for doing so which a benefit to seniors with arthritis and joint pain and can facilitate a person's perception of well-being. Water-based physiotherapy has been shown to achieve similar outcomes to land-based therapy. There is much research available describing the evidence and protocols for hydrotherapy or aquatherapy. A six week hydrotherapy intervention reduced pain and increased muscle function in an randomised controlled trial of 73 older women with osteoarthritis. Similar outcomes were seen in other studies as well as short term improvements in rheumatoid arthritis. See the aquatherapy page in Physiopedia for information on the theory and application of hydrotherapy within physiotherapy. Plyometric exercise is an attempt to use the stretch reflex of the muscle spindle and the elastic energy that is stored in a stretched muscle to enhance an immediate reciprocal contraction in that muscle.these exercises were designed to increase speed, power, and explosiveness. Plyometric exercise is meant to result in an increase in the ballistic ability of the muscle, that is, the ability to increase the explosiveness of the muscle contraction. There is no consensus in current literature on specific parameters or guidelines for incorporating plyometric training and it has been suggested that plyometrics only be incorporated in an exercise program only after, and alongside, a foundation of strength and flexibility has been achieved. Given that older adults generally have reduced strength and flexibility, plyometrics should only be introduced with demonstrably strong and flexible individuals who carry out tasks that are plyometric in nature. There is strong evidence that the volume and intensity of physical exercise reduces as individuals age and that the incidence of chronic disease increases. However, there is also evidence that this decline can be reversed, particularly in individuals who were previously sedentary. Increased strength and mass can be important steps in maintaining daily functional activities of independence in older persons in whom "disuse" atrophy has limited their daily activities. Regular physical exercise has long been an important recommendation for those with many of the chronic diseases typically associated with old age. These include non-insulin-dependent diabetes mellitus, hypertension, heart disease, and osteoporosis. The incorporation of aerobic and resistance exercise training into the life-style of older individuals can have a considerable impact on the functional capacity, physiological reserve, and independence. Adverse effects of exercise are a concern that clinicians should always keep in mind especially with a more frail population such as older adults. Adverse effects include: musculoskeletal injury such as joint pain or muscle soreness, loss of function, a cardiovascular event or even death. Serious events are rare. The most serious but least common of these is sudden death, defined as death occurring either during the actual activity or within 1 hour after it. Although reported rates of sudden death vary from 4 to 56 times greater than chance, the absolute risk is low: one cardiac death per 396,000 hours of jogging or one death per 15,000 to 18,000 exercises per year. The fear that the physical activity may stimulate osteoarthritis or exacerbate a pre-existing condition has kept some older adults from participating in an exercise program and may prevent health care professionals from recommending that they do so. However, the ACSM recommends the following considerations when prescribing exercise for older adults: "The intensity and duration of physical activity should be low at the outset for older adults who are highly deconditioned, functionally limited, or have chronic conditions that affect their ability to perform physical tasks. The progression of activities should be individual and tailored to tolerance and preference; a conservative approach may be necessary for the most deconditioned and physically limited older adults. Muscle strengthening activities and/or balance training may need to precede aerobic training activities among very frail individuals. Older adults should exceed the recommended minimum amounts of physical activity if they desire to improve their fitness. If chronic conditions preclude activity at the recommended minimum amount, older adults should perform physical activities as tolerated so as to avoid being sedentary." ↑ 1.00 1.01 1.02 1.03 1.04 1.05 1.06 1.07 1.08 1.09 1.10 1.11 Chodzko-Zajko WJ, Proctor DN, Fiatarone Singh MA, Minson CT, Nigg CR, Salem GJ, Skinner JS. Exercise and Physical Activity for Older Adults. Medicine & Science in Sports & exercise: Official Journal of the American College of Sports Medicine. Med Sci Sports Exerc. 2009. 41 (7): 1510-1530. Available from https://www.bewegenismedicijn.nl/files/downloads/acsm_position_stand_exercise_and_physical_activity_for_older_adults.pdf. Accessed 25 June 2018. ↑ 2.0 2.1 2.2 Avers DA, PT, MSEd Vice President of Academic Affairs Rocky Mountain University of Health Professions. Geriatric Physical Therapy. Los Angeles, California. ↑ 3.0 3.1 Cress ME, Buchner DM, Questad KA, Esselman PC, deLateur BJ, Schwartz RS. Exercise: Effects on physical functional performance in independent older adults. J Gerontol A Biol Sci Med Sci.1999. Vol. 54A, (5): M242-M248. Available at: https://academic.oup.com/biomedgerontology/article/54/5/M242/548272. Accessed 26 June 2018. ↑ 4.0 4.1 Baker MK, Atlantis A, Fiatarone Singh MA. Multi-modal exercise programs for older adults. Age Ageing. 2007. Volume 36 (4): 375–381. Available at: https://academic.oup.com/ageing/article/36/4/375/40634. Accessed 26 June 2018. ↑ 5.0 5.1 5.2 5.3 5.4 5.5 Liu C, Latham NK. Progressive resistance strength training for improving physical function in older adults (Cochrane review). Cochrane Database Syst Rev 2009; (3): CD002759. ↑ 6.0 6.1 6.2 Nelson ME, Rejeski WJ, Blair SN, Duncan PW, Judge JO, King AC, Castaneda-Sceppa C. Physical activity and public health in older adults: Recommendation from the American College of Sports Medicine and the American Heart Association. Circulation. 2007. 116(9), 1094-1105. Available from https://scholarcommons.sc.edu/cgi/viewcontent.cgi?referer=https://www.google.com.au/&httpsredir=1&article=1361&context=sph_epidemiology_biostatistics_facpub. Accessed 26 June 2018. ↑ Page P. Current concepts in muscle stretching for exercise and rehabilitation. Int J Sports Phys Ther. 2012 Feb; 7(1): 109–119. Accessed 24 September 2018. ↑ Maria Antoinette Fiatarone Singh. Exercise comes of age: rationale and recommendations for a geriatric exercise prescription. J Gerontol A Biol Sci Med Sc. 2002 57; 5: M262-M282. Accessed 24 September 2018. ↑ Walston JD. Sarcopenia in older adults. Curr Opin Rheumatol. 2012; 24(6): 623–627. Accessed 20 September 2018. ↑ Landi F, Liperoti R, Russo A, Giovannini S, Tosato M, Capoluongo E, Bernabei R, Onder G. Sarcopenia as a risk factor for falls in elderly individuals: results from the ilSIRENTE study. Clin Nutr. 2012 Oct;31(5):652-8. Accessed 20 September 2018. ↑ Fiatarone MA, Marks EC, Ryan ND, Meredith CN, Lipsitz, LA, Evans WJ. High-intensity strength training in nonagenarians effects on skeletal muscle. JAMA. 1990;263(22):3029-3034. ↑ Fleg JL. 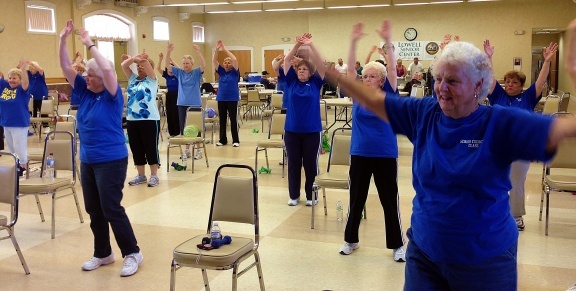 Aerobic exercise in the elderly: a key to successful aging. Discovery Medicine [Internet]. 2012. Available at: http://www.discoverymedicine.com/Jerome-L-Fleg/2012/03/26/aerobic-exercise-in-the-elderly-a-key-to-successful-aging/. Accessed 26 June 2018. ↑ Cartee GD. Influence of age on skeletal muscle glucose transport and glycogen metabolism. Med Sci Sports Exerc. 1994 May;26(5):577-85. ↑ Spina RJ, Ogawa T, Kohrt WM, Martin WH, Holloszy JO, Ehsani AA. Differences in cardiovascular adaptations to endurance exercise training between older men and women. J Appl Physiol. 1993 Aug;75(2):849-55. ↑ 16.0 16.1 16.2 Medeiros HB de O, Araújo DSMS de, Araújo CGS de. Age-related mobility loss is joint-specific: an analysis from 6,000 Flexitest results. Age. 2013;35(6):2399-2407. Accessed 23 September 2018. ↑ 17.0 17.1 17.2 17.3 Stathokostas L, Little RMD, Vandervoort AA, Paterson DH. Flexibility training and functional ability in older adults: a systematic review. Journal of Aging Research, vol. 2012, Article ID 306818, 30 pages, 2012. Accessed 23 September 2018. ↑ Mooventhan A, Nivethitha L. Scientific evidence-based effects of hydrotherapy on various systems of the body. N Am J Med Sci. 2014; 6(5): 199–209. Accessed 25 September 2018. ↑ Carere A, Orr R. The impact of hydrotherapy on a patient’s perceived well-being: a critical review of the literature, Phys Ther Rev. 2016; 21 (2): 91-101. ↑ Zivi I, Maffia S, Ferrari V, Zarucchi A, Molatore K, Maestri R, Frazzitta G. Effectiveness of aquatic versus land physiotherapy in the treatment of peripheral neuropathies: a randomized controlled trial. Clin Rehabil. 2018; 32 (5): 663–670. Accessed 25 September 2018. ↑ Dias JM, Cisneros L, Dias R, Fritsch C, Gomes W, Pereira L, Santos ML, Ferreira PH. Hydrotherapy improves pain and function in older women with knee osteoarthritis: a randomized controlled trial. Braz J Phys Ther. 2017; 21(6): 449–456. Accessed 25 September 2018. ↑ Silva LE, Valim V, Pessanha APC, Oliveira LM, Myamoto S, Jones A, Natour J. Hydrotherapy versus conventional land-based exercise for the management of patients with osteoarthritis of the knee: a randomized clinical trial, Phys Ther. 2008; 88(1): 12–21. Accessed 25 September 2018. ↑ Foley A, Halbert J, Hewitt T. Does hydrotherapy improve strength and physical function in patients with osteoarthritis—a randomised controlled trial comparing a gym based and a hydrotherapy based strengthening programme. Ann Rheum Dis 2003 ;62:1162-1167. Accessed 25 September 2018. ↑ Al-Qubaeissy KY, Fatoye FA, Goodwin PC, Yohannes AM. The effectiveness of hydrotherapy in the management of rheumatoid arthritis: a systematic review. Musculoskeletal Care. Published online 16 July 2012. Accessed 25 September 2018. ↑ 25.0 25.1 Davies G, Riemann BL, Manske R. Current concepts of plyometric exercise. Int J Sports Phys Ther. 2015 Nov; 10(6): 760–786. Available at: https://www.ncbi.nlm.nih.gov/pmc/articles/PMC4637913/. Accessed 26 June 2018. ↑ Johnson RJ. Sudden death during exercise. Postgrad Med1992;92:195-206.